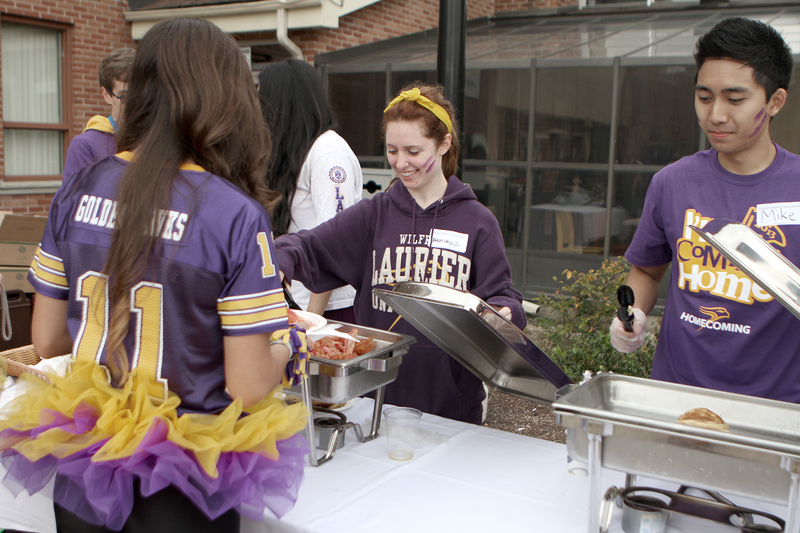 The streets were filled with purple and gold this weekend, as Sept. 28 marked Wilfrid Laurier University’s (WLU) annual Homecoming festivities. Laurier is often recognized for its overwhelming school spirit, so it is no surprise that thousands of students and alumni flooded into University Stadium to cheer on the Golden Hawks as they played against the Windsor Lancers. “Homecoming is like Christmas, except better!” said one game-goer, fourth-year student, Amy Price. “I love how it brings everyone together,” remarked Carley Berry, another fourth-year student. The weekend’s events were said to have gone quite peacefully, with no major concerns from the Waterloo Regional Police Service (WRPS). “The weekend went very well, and was very peaceful despite the large crowds that we saw,” said Alana Holtom, corporate communications coordinator for WRPS. Holtom noted that the larger crowd sizes on the streets and roads were partially due to the warm weather. “It was a long day for our officers,” she said, as the festivities began early Saturday morning and carried on late into the evening. WRPS officers were sent out on foot, on bicycle, in vehicles and on horseback. Officers from the WRPS, as well as from Laurier’s Special Constable Services were stationed both at the game and throughout nearby streets in an effort to control crowds and issue tickets for instances of open alcohol and public intoxication. WRPS took on a new initiative this year and implemented live Twitter updates. This live tweeting was an attempt to keep street-goers up to date with what was happening and to remind them of the rules that they were enforcing in order to ensure the safety of all. Holtom noted that the police saw a definite change in students this year, as many have now “gotten the message” that open containers of alcohol are not permitted in public and as a result, fewer instances occurred. “We’re a friendly bunch, we are not here to come down on everyone, we just want to make sure everyone is celebrating safely,” explained Holtom. Alongside the festivities at the game on Saturday, Homecoming also encompasses a variety of other events, which involve year-long planning. “We had an excellent, record setting year,” Heather Ferris, this year’s Homecoming coordinator, said. She went on to explain that attendance at the game, and at the other events,was at an all-time high. On Sunday, the annual Laurier Loop race saw a record of 658 runners, and raised over $12,000 towards the Sun Life Financial Movement Disorders Research & Rehabilitation Centre (MDRC). “Overall, it was a really well-received weekend, we had no major concerns,” concluded Laurier’s SCS operations manager, Chris Hancocks. For Amanda Forsyth, a fourth-year kinesiology student at Laurier, it was a bittersweet occasion. This was her last Homecoming weekend as a Laurier student.